Ever thought of using a papad to make a snack .. check out this recipe and you will be amazed how simple it is to make and yet so delicious. You can make it in a jiffy when you have unexpected visitors. 1. Boil the potato and cut into small pieces. 2. Cut the other vegetables into tiny pieces and boil them. 3. Heat a little oil in a pan and saute the garlic paste. Then add the onions and stir fry for half a minute. 2. Place them on a flat surface and pat them dry with a kitchen towel. 3. Mix the maida with a little water to make a paste. 4. Place the filling in the middle and fold them like spring rolls and seal the edges with the paste. 5. Repeat the process again with more papads. 6. Deep fry the rolls and drain them on a paper towel. PS: The above recipe makes 4-5 rolls. 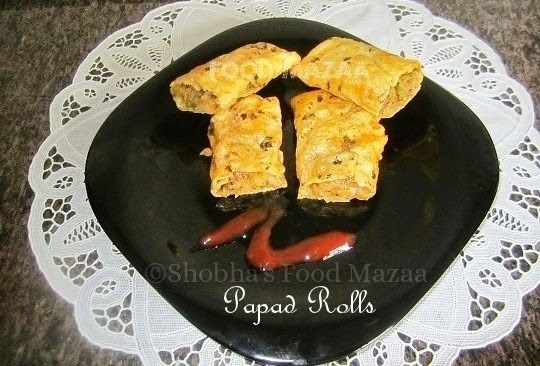 Papad rolls looks super crispy and yummy..
great shobhaji...love the papad with filling...mouthwatering!! Wav nice idea of making papad snack....looks fabulous and delicious! too good idea.. nice n innovative recipe.. I'm amazed. Interesting recipe, Shobha. I just roasted or fried papad, making rolls like these are a great idea. Wow.. Very nice idea.. I watched this sometimes back in one of tamil channel too with tomatoes and onion.. Love this..